Hooray! 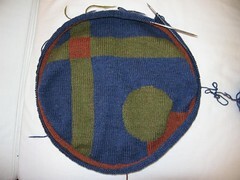 Christmas knitting is over and I can start posting things on my blog again. I was so excited to be done with my presents I immediately started knitting some socks for myself Christmas day, and finished them before 2007 was over too! 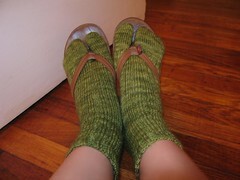 They're simple toe up socks with a separate toe so I can wear them with sandals. The yarn is Fleece Artist Sea Wool, 70% wool and 30% sea cell, so smooth and soft with great stitch definition, I just hope they hold up pretty well. 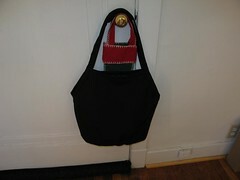 Also very exciting over the holidays was the new Tom Bihn Swift bag I received, really great knitting bag. I carry everything around in it, but it fits my knitting too. First resolution I have for 2008 is to finish my chair cushions. Been a bit frustrated with these since I worked the icord around the edge wrong a couple of times and all the frogging started to get to me. However, I was a determined soul yesterday and pushed past the stumbling block and I'm making some good headway now, just have to make sure I keep it going!